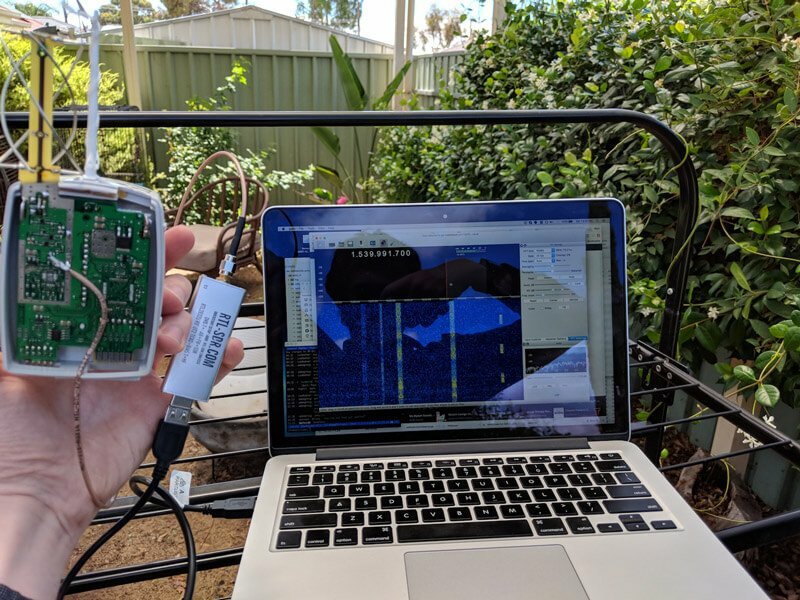 Over on his blog VK5QI has shown how he has was able to re-purpose an old radiosonde into a wideband active L-band antenna. Radiosondes are small packages sent up with weather balloons. They contains weather sensors, GPS and altitude meters and use an antenna and radio transmitter to transmit the telemetry data back down to a ground station. With a simple radio such as an RTL-SDR and the right software, these radiosondes can be tracked and the weather data downloaded in real time. Some hobbyists such as VK5QI go further and actually chase down the weather balloons and radiosondes as they return to earth, collecting the radiosonde as a prize. VK5QI and his friend Will decided to put some of his radiosonde collection to good use by modifying one of his RS92 radiosondes into a cheap active L-band antenna. They did this by first opening and removing unnecessary components that may interfere such as the main CPU, GPS receiver, 16 MHz oscillator, SAW filters and balun. They left the battery, LDO's, LNA's and Quadrifilar Helix GPS antenna which is tuned to the GPS L-band frequency. Finally they soldered on a coax connector to a tap point on the PCB and it was ready to use. They then connected the new antenna to a RTL-SDR V3 and fired up GQRX. They write that their results were quite promising with several Inmarsat and Iridium signals being visible in the spectrum. VK5QI also used gr-iridium with the antenna as was able to decode some Iridium signals. Modified Radiosonde L-Band Antenna connected to a RTL-SDR V3. This works very well in the 1500 and 1600MHz range (all filters removed) … much wider than any patch antenna and great S/N. But I have no clue how Ben would receive ADS-B with it … I haven’t tried it – sure you will receive ADS-B frames, just as you do with an inch of wire or a screwdriver, but there is no natural resonance or antenna gain and I don’t think this is a good ADS-B antenna – though when rebuilding it for 1090 MHz I am sure it will rock. One more thing on the radiosonde situation in Germany, here most civil weather balloons are equipped with the modern full GPS via patch antenna RS41 instead of the formerly used RS92 which comes with the nice quadrifilar GPS antenna. It is very likely that all stations will soon use the RS41. So make sure you are hunting the right one – very easy to differentiate … RS41 uses pulsed modulation RS92 continuous signal … and your decoder software mode will obviously tell you what model you are receiving. Any idea if the modification would be similar for the Radiosonde Rs 80-15 N? Hi, can you share an photograph of the GPS part of that sonde ? I think I indeed used that one also with succes but I don’t remember for shure. You can send the link or image to pe2bz at pe2bz dot nl. https://imgur.com/a/4dsue Indeed I did use that one with great succes for indoor ADSB and to see Irridium signals in the L-band. Bypass the SAW filter between the antenna and the first stage feed it with power and attach the output coax wire to the capacitor behind the last amplifier stage.